Position a rack in the center of the oven and preheat to 400°F. Pour a 1/4-inch-deep layer of coarse salt into a small baking dish just large enough to hold the beets. Roast the beets, turning occasionally, until tender when pierced with the tip of a sharp knife, about 25 minutes. Brush off any salt. When cool enough to handle, peel the beets. Place the beets in a small bowl, and toss with the vinaigrette and shallot. Season with salt and pepper. If preparing ahead, don’t dress the beets until ready to serve. Divide the goat cheese stick into 4 equal pieces approximately 1 oz. Cut 4 long strips of the leek about 4 mm wide, make sure to follow the grains of the leek. In a saucepan of boiling salted water, blanch the leek about 10 seconds; ice it immediately to set the color. Place on a kitchen towel to dry, and transfer to a large platter. Cut the end of the Belgium endive and place 20 large leaves on a plate, place 5 leaves around each goat cheese and tie it together with the leek strip. When ready to serve, whisk the walnut vinaigrette with the shallot, and pour enough over to coat evenly. Season with salt and pepper and carefully roll the Belgium Endive with Goat Cheese in the vinaigrette to dress it. Position a rack in the center of the oven and preheat to 400°F. In a medium bowl, toss the walnuts, sugar, and 1 tablespoon water and roast them for 4 minutes. When cool enough to handle, chop the walnuts. In a medium bowl, whisk the vinegar and the walnuts. Gradually add the oil, whisking until emulsified. Season with salt and pepper. 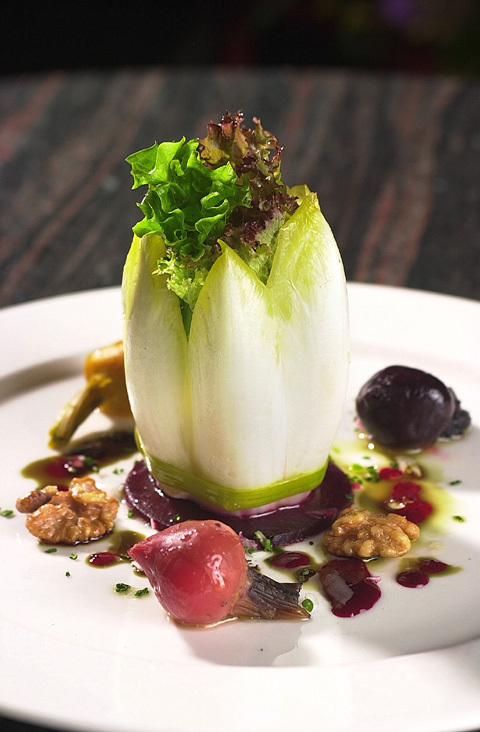 Just before serving, toss the salad with the vinaigrette, season with salt and pepper, and stuff the Belgium Endive. Place the stuffed Belgium Endive on 4 chilled dinner plates. Place 3 of the roasted beet salad on each plate; drizzle each serving with about 1 tablespoon of Austrian Pumpkin Seed Oil and garnish with roasted walnut the organic baby leaf lettuce. Coarse salt and freshly ground white pepper to taste.